Molybdenum does not occur free in nature; it is usually found in molybdenite ore, MoS2, and wulfenite ore, PbMoO4. Molybdenum is also recovered as a by-product of copper and tungsten mining. It is a silvery-white metal of the chromium group. It is very hard and tough, but it is softer and more ductile than tungsten. It has a high elastic modulus. Of the readily-available metals, only tungsten and tantalum have higher melting points. Molybdenum is an important alloying agent which contributes to the hardenability and toughness of quenched and tempered steels. It also improves the strength of steel at high temperatures. It is used in certain heat-resistant and corrosion-resistant nickel-based alloys. Ferro-molybdenum is used to add hardness and toughness to gun barrels, boilers plates, tools, and armor plate. Almost all ultra-high strength steels contain 0.25% to 8% molybdenum. 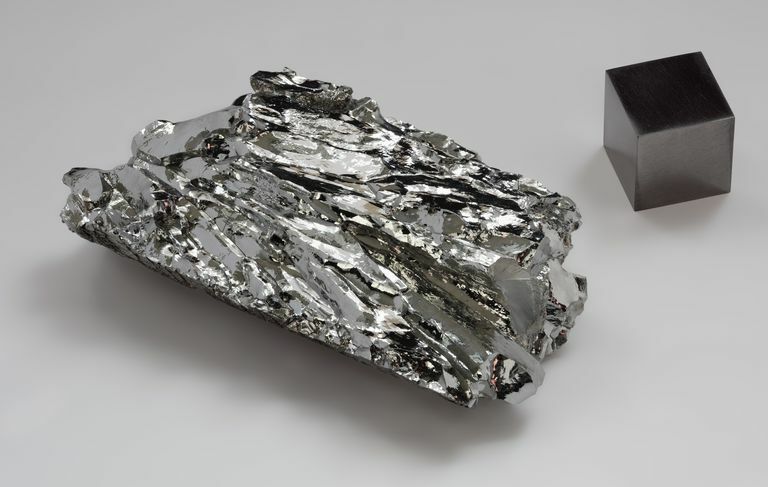 Molybdenum is used in nuclear energy applications and for missile and aircraft parts. Molybdenum oxidizes at elevated temperatures. Some molybdenum compounds are used to color pottery and fabrics. Molybdenum is used to make filament supports in incandescent lamps and as filaments in other electrical devices. The metal has found application as electrodes for electrically-heated glass furnaces. Molybdenum is valuable as a catalyst in the refining of petroleum. The metal is an essential trace element in plant nutrition. Molybdenum sulfide is used as a lubricant, particularly at high temperatures where oils would decompose. Molybdenum forms salts with valencies of 3, 4, or 6, but the hexavalent salts are the most stable.